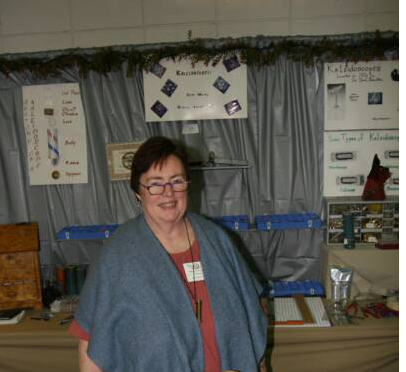 Beth Woody became a member of the Village of Yesteryear in 1969 and has participated every year since then. She began with Christmas decorations. Her husband, Allen, joined her a few years later with candles. When she moved on to sculptured paper lampshades, Allen made and/or wired lamps for her to use with the shades. They also make old-fashioned lye soap and have demonstrated making this at heritage re-enactments. Having always been interested in Marquetry, she studied and practiced making it for a number of years before bringing this intriguing craft to the Village. Although the Village of Yesteryear is her major exhibit, she does a few other shows throughout the year, and please free to contact her for a show schedule. She is available for visits to her shop by appointment only.